This landscape renovation was one for the books! The existing landscape was overgrown and tired and needed a major overhaul. We knew there was little we would save in this landscape which made it easy to get our equipment in and out. Our client wanted a raised patio for easy access off her sun-room. She is an animal lover and needed her dogs to have a quick way to the grass. We cleaned up the pathways and simplified them with straight lines and pavers for easy maintenance. We installed a artificial turf area for the dogs to do their business in the winter months. We made sure there was proper drainage in this area. We built and installed a railing along the entire patio for when she needs the pups to stay on the patio! A pavilion sits in the backyard providing lots of shade and a cozy area for fires, snuggles, and reading. A raised garden area is tucked into the corner of the backyard which is full of berries! Raised gardens make gardening much easier on the knees and back! A subcontractor installed a beautiful, low-maintenance privacy fence. We installed lots of lighting throughout the backyard resulting in lots of extra hours to enjoy the landscape. We love the privacy of this backyard landscape! This outdoor living space has it all for the outdoor-loving family! 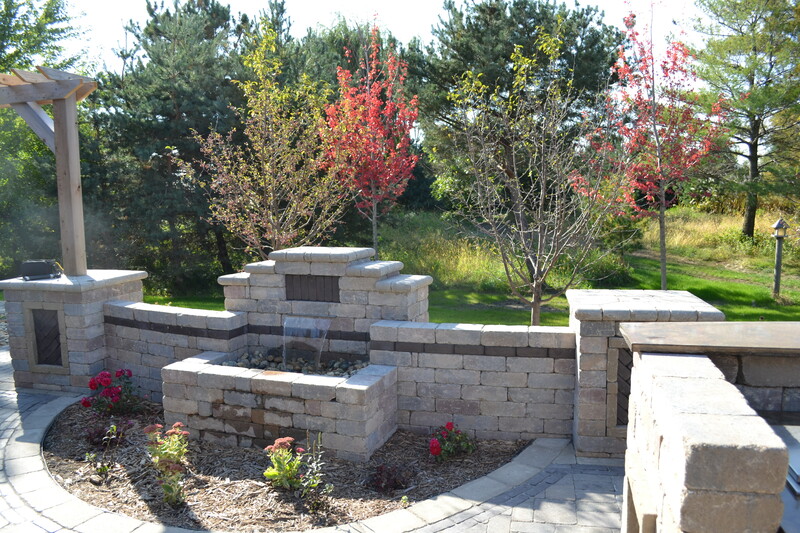 This large space includes a fountain, a fireplace, raised planting beds, seat walls, outdoor lighting, paved walkways, and an outdoor kitchen! The beauty lies in the details. A beautiful cedar pergola was installed over the outdoor living room and the wood texture was repeated in the cedar arbor at the entrance to the backyard. The wooden structures add vertical interest and a softer, warmer texture. Unilock pillars embellish the look with a grand statement! Beautiful Unilock Copthorne inlays add detail and elegance. In addition to the raised fireplace area, there’s an outdoor kitchen and bar which are perfect for backyard entertaining and dining. Landscape lighting adds to the after hours ambiance along with the romantic fireplace and soothing sound of the fountain. The entire space is connected to a covered porch for extra seating and protection from mother nature. This is outdoor living at it’s finest! Raise your hand if you need a space like this! This patio has bold curves that soften the hardscape and add natural elements. 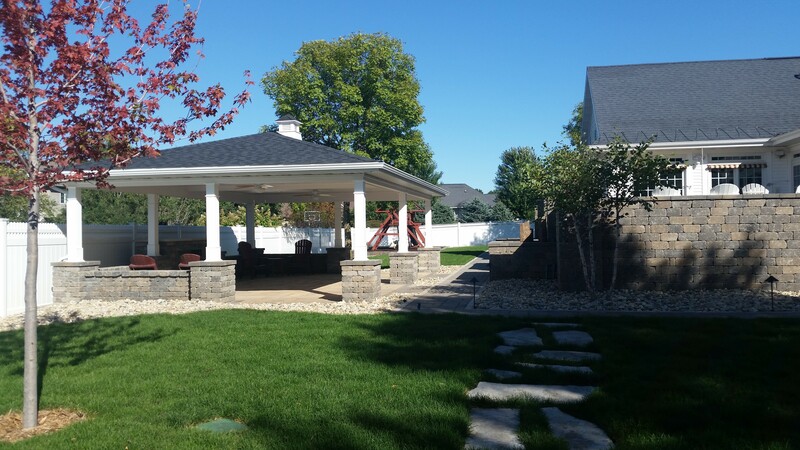 Our client wanted a patio that was large enough for big groups of people but also small enough for more intimate moments such as morning coffee with his wife! We installed hardscape lights along the patio for safety and ambiance. Working with natural products takes a little more time because of irregularities but we love the way this raised patio turned out! Our foreman and landscape manager worked hard to get this one right! The client mixed man-made and natural products for this gorgeous patio. We raised the patio in order to address some grading and water issues. The client wanted to use a natural stone to add some interest. 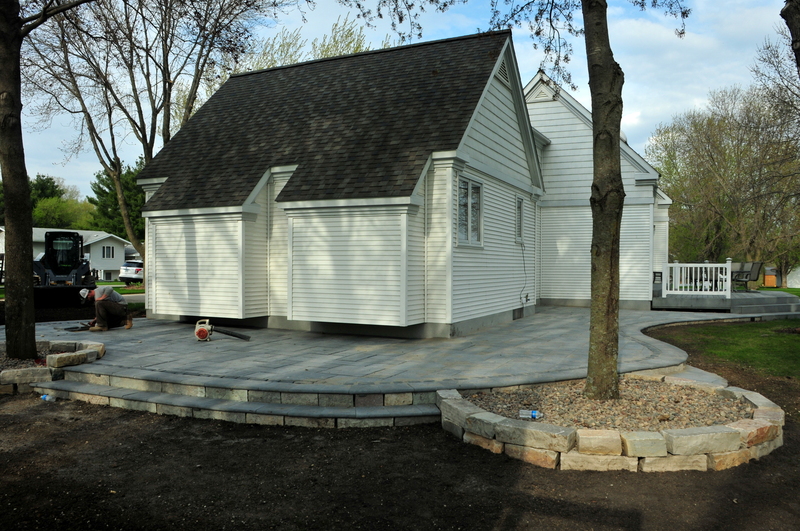 We used a cut-stone called weathered Chilton from Weber Stone Company in Anamosa, Iowa. 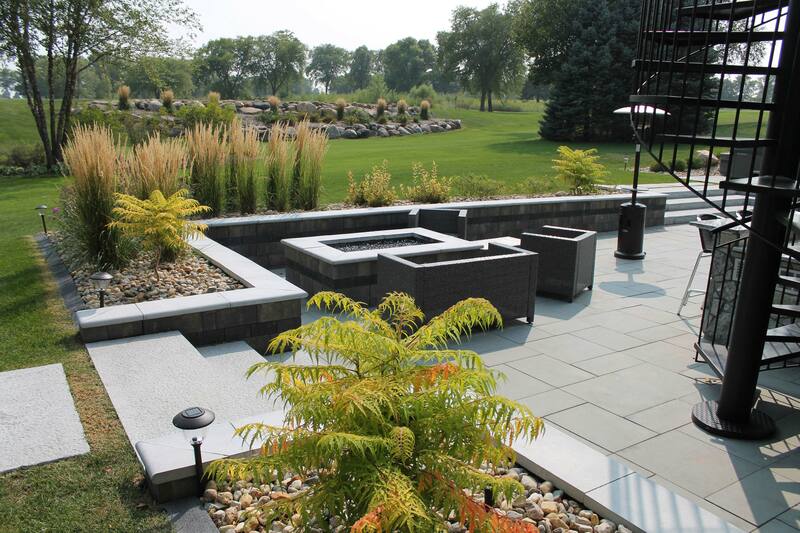 Slate in Bluestone from RCP (Rochester Concrete Products) for the slabs adds a bold look. We dressed up the patio with an onyx Cobble Stone inlay from RCP. Finally, for the kingrow we used Slate Bullnose which flows great with the slate patio. Finally, tying in the existing trees with raised planters made from weathered Chilton, finished the look! Do you like natural products or man-made?